This unit is perfect for people who are looking for a good quality device for an affordable price. One of the important things nowadays is food preservation. Food dehydrators work on a simple principle. They draw the moisture from the foodstuff and thus prolong its lifespan. What’s rare about this dehydrator is that it’s made in the US. The Excalibur 2900ECB9 offers a great variety of different useful features. It’s well-made, and it consists of durable materials. You can dehydrate anything you want in it, starting from fruit up to beef and meat in general. The Excalibur 2900ECB9 is great when it comes to drying different foodstuff. You can dehydrate anything from meat to delicate herbs and fruit. It is also a great choice for large family gatherings because it offers nine racks. This unit features a back fan. While some products have vertical airflow, the horizontal system is much more efficient when it comes to drying large quantities of food. This method prevents the flavors from mixing up and thus allows different types of food to be dehydrated simultaneously. Also, you won’t have to rotate the trays manually thanks to the horizontal airflow system. This method is the crucial factor that separates this unit from the others on the market at the moment. The Excalibur2900ECB9 is great for family gatherings, picnics, parties, and so on. 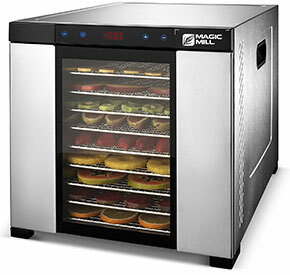 With its 15 square feet of drying space, it can tackle large quantities of food at once. The large capacity saves time and power as well. You can also use this dehydrator to dry large pieces of meat. The plates are also pretty big and can hold out a lot of weight. The square shaped racks are better than the circle shaped ones because the food dries faster when it’s categorized in a square pattern. It can also take on more food than the conventional ones thus saving you some time and hassle. They are made of polycarbonate ABS plastic which is a material approved by the FDA. It is also better than the regular plastic and contains less toxic elements. Light affects the whole process of dehydration, and darker dehydrators are always a better choice. Many vitamins found in fruit are sensitive to light, so a darker environment is optimal for these vitamins to survive and keep the nutrition values of the fruit on a high level. This feature is also one of the most noticeable ones because most of the conventional dehydrators come with a transparent door and thus affect the whole drying process in a negative manner. This product comes with nine trays that can be added or deducted as per your requirement. If you want to put a larger piece of meat in the unit, simply pull out a few racks, and you’ll get enough height inside. The Excalibur 2900ECB9 comes with an adjustable thermostat which has a range of 95 to 155 degrees Fahrenheit. It is a pretty vast range, and it helps when it comes to diversity. That’s why you can dry a vast variety of foodstuff, from meat to pineapples without much hassle. If you want to preserve certain enzymes in the fruit, you can lower the temperature down with high precision. One of the notable things about the tray is that it comes separate from the mesh sheets. The sheets are made of a poly-screen material which is densely knitted and prevents small pieces of food from falling through the racks. It’s also a non-stick material which means you don’t need additional cooking paper or anything of that nature. The design is contemporary, and it looks like a genuine American product; it’s well-made, and they used quality materials during the production. The whole casing is black except the thermostat. The weight of this item is 22 pounds. This dehydrator has a rear mounted fan, and it dries the foodstuff using horizontal airflow. It also distributes heat evenly thanks to the horizontal airflow. The door doesn’t have a hinge system, but it can be removed thus offering open access to the racks inside. They are dark-colored and impenetrable by light. This unit is pretty large, and it’s suitable for large gatherings and gardens. It won’t fit well in a conventional kitchen. The dimensions are – (H) 12.5 inches x (W) 17 inches x (D) 19 inches. The Excalibur 2900ECB9 has a pretty good thermostat which has a range of 95 – 155 degrees Fahrenheit. This vast range allows it to dry a variety of food. This product doesn’t have an On/Off switch, but it turns itself off automatically when the process is finished. So, you won’t have to unplug it from the power socket every time you finish drying. There are a lot of things you should know about this dehydrator before considering a purchase. We’ve made a list of some notable good things about it. The first thing you notice when you see this dehydrator is the size of it. You can tell it can withhold large quantities of different food. The size also affects the time-saving aspect. It’s one of the best in its price range when it comes to heat distribution and thermostat precision. Because of the horizontal airflow system, it distributes heat in an even manner throughout the whole unit. It doesn’t require a lot of maintenance at all. As we said, it can be stored outdoors without many issues. The racks come separate from the sheets, and that makes them incredibly easy to clean. The trays are also dishwasher safe. This unit draws only 440W when in peak, which is a negligible amount of power. In fact, when it comes to the power-to-performance ratio, Excalibur2900ECB9 is great. Considering the quality of this food dehydrator, it’s very affordable, especially if you’re running a business. If you need large quantities of dried food at once, this is the most affordable quality dehydrator. This product, like any other, has its disadvantages as well. There aren’t many of them, though, but these are some of the ones worth mentioning. The absence of timer is a pretty common occurrence in this price range, but it’s still a bit annoying. You will need to keep an eye on the unit while it’s working; i.e. you won’t be able to leave the house. Power buttons are rare in this price range, just like the timer. However, it can turn itself off after finishing a cycle. Although, it’s advised that you unplug it from the power socket after use. This occurrence isn’t frequent. Only a few of the users have been complaining about the noise, but it’s a fact worth mentioning. This product is not very mobile due to its bulky size and hefty weight. 1. Can I dehydrate fruit in this unit? Yes, you can. You can dry anything you want as long as it can fit in. 2. Is the polycarbonate material safe? Yes, the material is safe and non-toxic. The sheets are also dishwasher safe. It is also BPA-free. The Excalibur dehydrator comes with a 5-year limited warranty. 4. How big are the trays? The trays are 14 x 14 inches (with the edges). 5. What is the difference between the economy and deluxe models? The difference is in wattage. The deluxe model is 600 Watts while the economy model is 440W. This dehydrator is ideal for parties, barbecue parties, gardens, and gatherings in general. Also, if you have a business that requires large amounts of dried food at once, this might be the unit for you. It’s considered affordable and very cost-efficient. It’s well-made by an American company which used only the finest and safest materials. Although it has a few downsides such as the absence of a timer, it’s nothing one can’t handle. It has a great 4.7-star out of 5 stars rating on Amazon which is superb.